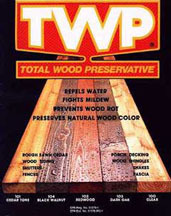 We use Total Wood Preservative (TWP) transparent stains for most of our work on decks and natural wood houses. TWP is a deep penetrating pigmented oil preservative. As discussed in the “Wood Facts” page; products that form a protective barrier on top of the wood may look good initially, but are of little value, since they easily wear off (usually in less than a year). Far superior are products like TWP that protect the wood by being absorbed into the wood fibers themselves, replenishing the natural oils depleted due to the elements. 1. They use clean, high grade, deep penetrating paraffin and citrol oils, penetrating deep into the wood, protecting from inside the wood versus leaving excessive surface film build up. 2. They use automotive grade transoxide pigments. These pigments are much finer than the bulky organic pigments used in other products. The end result is a more natural looking color that highlights the existing grain pattern with amazing clarity and warmth. TWP essentially works like this: During the weeks after TWP is applied to your wood, the oils penetrate deep into the wood grain leaving the pigments on the surface. 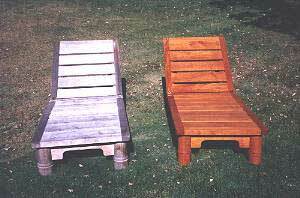 The oils and resins rehydrate the wood and create a waterproof seal. The pigments stay on the surface to enhance your wood’s natural beauty and create a protective shield against the sun’s damaging ultra-violet rays. The TWP colors are Cedartone, Redwood, California Redwood, Dark Oak, Black Walnut, Cape Cod Gray and Prairie Gray. We use two of the TWP products, TWP 500 series and TWP 200 series. The 500 series used primarily on decks and new wood siding contains 65 percent solids. The 200 series, also referred to as “Radcon”, contains 95 percent solids; and is applied on wood homes and sometimes added to the 500 series when treating older wood decks that can absorb the extra solids. Solids refer to pigments, oils and resins that block the sun’s rays. The 200 series, or “Radcon”, being a heavier material; takes significantly longer to absorb into your wood leaving more solids on the surface. On homes we generally recommend anywhere from a 25/75 200 series Radcon / 500 series blend to using a 100 percent Radcon solution. In our opinion, using at least 50 percent “Radcon” gives a better appearance and longer protection. We will let you be the judge after you’ve previewed our work; and have spoken to some of the many satisfied owners of homes we have cleaned and preserved in the Marin area. It is often best to see the color blend on other homes before making a color decision. When one of the TWP products is not suitable for a job and we need a stain with more solids or a latex based product, we use one of the products from the Flood Company. Click here to learn more about the Flood Company’s selection of quality products. We use Benjamin Moore paints exclusively on all our interior or exterior painting work. Benjamin Moore paint products are widely recognized in the painting industry as being the best paint money can buy. Benjamin Moore technology incorporates oil based properties into a latex paint. This has given their paints the strength of oil based paint along with the ease of application and flexibility of latex paint. Click here to learn more about Benjamin Moore’s extensive line of quality products. Click here to learn more about Kelly Moore Paint’s selection or quality products. Click here to learn more about Armstrong Clark’s selection or quality products. Please Contact Us For A Free Quote or anything we might assist you with.